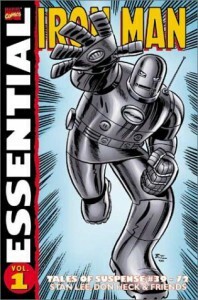 The first volume in the Essential Iron Man series naturally features Shellhead's first appearances in Marvel Comics' Tales of Suspense. These are some fun stories, even if a lot of them are somewhat forgettable. Iron Man battles a villain called Doctor Strange, a giant caveman robot and a mess o' Commies before getting into with his soon-to-be Rogues' Gallery: Crimson Dynamo, the Melter, the Mandarin, Mr. Doll ... okay, so even then, not all of them were classics. Captain America, the Angel (and the original X-Men) and Hawkeye the Archer (when he was a bad guy) also show up in these pages. The artwork is a sixties' dream: Don Heck, Jack Kirby and Steve Ditko all take turns at the helm, with Ditko re-designing Iron Man's golden armor into the red-and-yellow suit he was most associated with for the next 25 years. 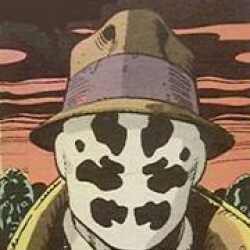 While there are, as I mentioned, a lot of stories that read like filler, is actually is an "Essential" volume for once, for both fans of the Golden Avenger and Marvel Comics in general.